Ceviche, a Latin American culinary tradition. Imagine that you come out of the sea, feel the warmth of the sun rays in your face, walk on soft white sand and then you get to enjoy this fresh delicious dish while you enjoy the view! Yes, this is something you can enjoy during your visit to the beaches of Latin America. Let me introduce you to what for me are the absolute best cold soup you can find in Ecuador and in South America, ceviche. A magical place for you to relax and enjoy wonderful food! This cold soup or cocktail is made of fresh raw fish, oysters or shrimp cooked in lime juice and salt, mixed with onions, peppers, tomatoes cilantro, and lime juice. 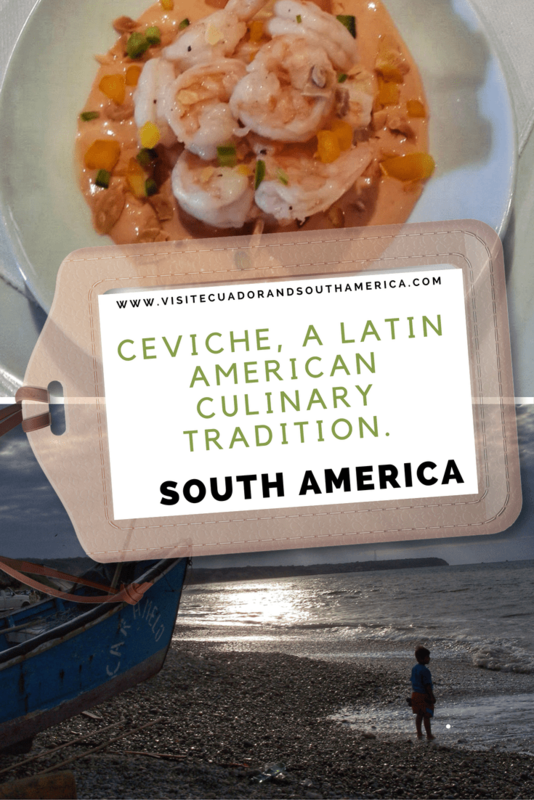 Ceviche is in fact a traditional dish that extends from Mexico to Chile and is served in the cities located by the sea, or regions where all main ingredients abound. I am now going to go more in detail about the ceviche made in Ecuador, as it is the one I like the most. What makes Ecuadorian ceviche different? Ecuadorian ceviche has more juice than the peruvian version and is less sour than the chilenian one. In addition, its main sauce consists of tomato and lime/lemon. 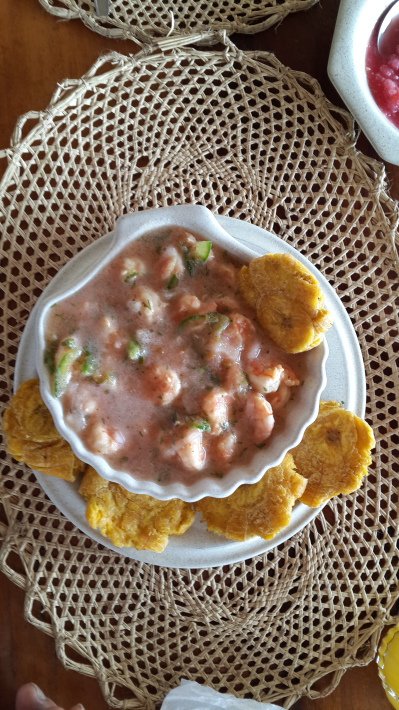 As side dishes you can observe one of them in the picture above, Ecuadorian ceviche is served with chifles which are fried plantain chips, and also but not always, with popcorn, patacones or toasted corn (tostado). 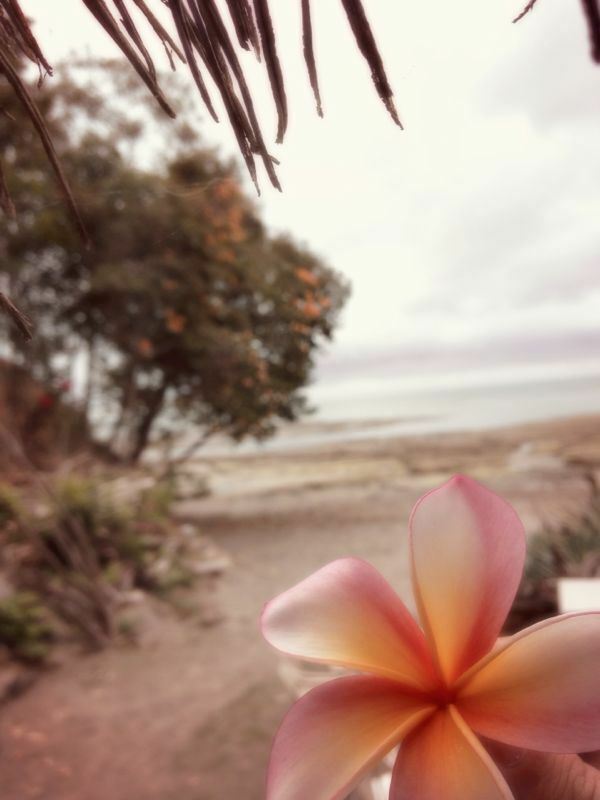 Ideally you should visit one of the beautiful warm beaches of Ecuador in order to enjoy the fresh flavours of ceviche. Want to learn to make some of ceviche and other Latin-America dishes? Gran Cocina Latina: The Food of Latin America, comprises 500 well written recipes from all Spanish speaking countries in Latin America, providing great information and recipes of the exciting food you can prepare at home while you plan your visit to South America.